I’m not a particularly brave person. I don’t say that in a self-deprecating way. I say it in a neutral way – like stating my preference for English muffins covered in PB&J for breakfast. 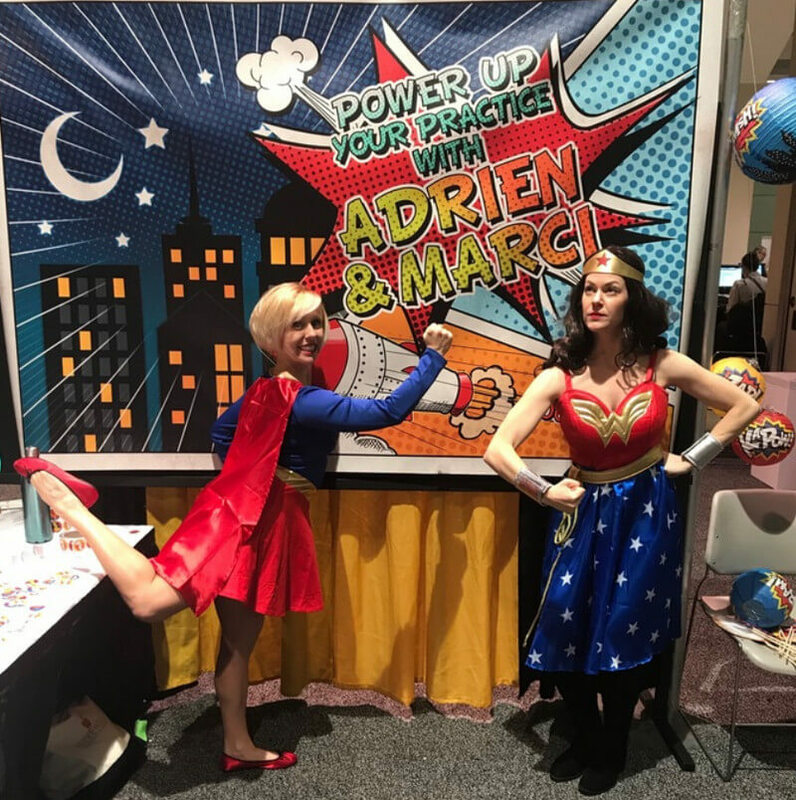 But at a recent annual nutrition conference (which drew over 10,000 registered dietitians), my bravery was put to the test. I’d like to tell you that story, not for bragging rights, but because I discovered a recipe for doing something terrifying, yet deeply rewarding. I hope what I learned inspires you to do the brave thing, even when you don’t want to. But before I tell you about my 30 seconds of bravery, let me back up a bit. This annual conference and my membership with the associating organization (The Academy of Nutrition and Dietetics) is a bit tricky for me since 1% of its membership practices in alignment with my beliefs, ethics, and values around food and body. I made that number up, but you get the gist. I’m not a lone wolf, but our pack is mighty small. And yet, through this association, I have connected with some of the most incredible colleagues and mentors, helped to integrate messages of body acceptance and self-trust in small but meaningful ways, and taught countless dietitians and students about eating disorders. It also sparks and nourishes my inner entrepreneur, so I stay. I also hung out with some of my absolute favorite people while brainstorming, scheming, and inventing ways to recruit members to our anti-diet and body lovin’ clan. Muahhahhaaaa!!!! As I listened to the talk, I felt my frustration and anger grow. You may not know that I am a fairly conflict-avoidant person. I prefer harmony over a hearty debate any day of the week. And while it was the last thing I wanted to do, I knew that I needed to speak up during the Q&A. And so I did. I thanked them for holding such an important conversation and offered another perspective – a size acceptance frame that does not assume that a body is wrong or sick or in need of fixing simply because of its size. A frame that teaches self-care and self-kindness, not weight, as the keys to health. The presenters respectfully disagreed and they were eager to shuffle me off the mic. I was nervous but I did it and I felt proud! Each of you has to do hard things that you don’t feel up to. I know you do because it’s a pesky part of being human. So I hope that this little recipe for bravery will serve you as you tackle the tough stuff of life. In hindsight, I learned about what helped me and I know I’ll need to use these ingredients time and again. Recruit Support: During the talk, I reached out to trusted colleagues and they encouraged me to speak up and let me know they were right there with me, even if they weren’t in the room. I envisioned each of them and that gave me both strength and accountability. That was POWERFUL. Drop Perfection and Settle for Good Enough: My friends reminded me that, even if it doesn’t come out right or if my voice is shaking, the message still needed sharing. I’m sure there were a zillion ways to communicate my message but if I waited for perfect, I wouldn’t be writing this to you. Accept Discomfort and Trust Impermanence: I asked myself, “What’s the worst that will happen?” Self answered, “I’ll feel nervous and uncomfortable and scared. I’ll feel like I want to puke but I can handle all of that. It won’t last for long. Those feelings will dissipate.” That was true. I didn’t puke but I did feel shaky for about an hour. Remember Your Purpose: In addition to envisioning my colleagues, I also envisioned my clients who trust that I am their advocate (I try to be). My purpose was to speak on their behalf and that was bigger and more important than all of the fears bubbling up inside of me. The vision of my clients literally propelled me to the mic. I wanted to do right by them. Recruit More Support: You better believe I checked back in with my colleagues who buoyed me up when I was at risk of dipping into a full-blown vulnerability hangover! I would love to hear your stories of bravery for whatever you are facing. Drop me a line on Facebook, Instagram, or my blog anytime. And if you are interested in the topic of weight stigma, I wrote an article on Weight Stigma in Dietetics Practice that may be useful to you.